To make the ride more comfortable, you can choose to upgrade some details in the cabin. Leather-trimmed seating is available, and these seats come with elegant French stitching. 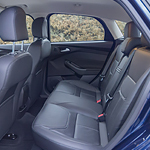 If you prefer even more luxury, the Ford Focus Titanium has a leather-trimmed eight-way power driver's seat, heated front seats, and a heated leather-wrapped steering wheel. Keeping people entertained is the available SYNC 3 system. It allows you to interface with your phone through voice controls and Apple CarPlay or Android Auto. You can make calls hands-free, receive text messages while you travel, get turn-by-turn directions, and stay updated on traffic information. SiriusXM Traffic and Travel Link subscriptions can be added on to the package for even more information.